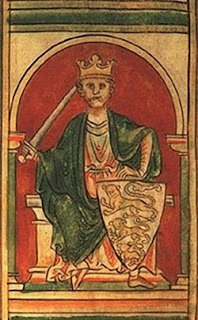 Richard I was given the nickname Lionheart (or Coeur de Leon) for his exceptional fighting ability and courage. The duke of Normandy and the Count of Anjou, he ascended to the throne of England in 1198 after defeating his father Henry II with the help of his powerful mother Eleanor of Aquitaine. Richard took the cross in 1188 when he heard of Saladin’s successful conquest of Jerusalem. He raised funds by selling official titles, rights and lands to the highest noble bidder. He left for the Holy Land in 1190 along with French King Philip II and most of the military forces of Christendom. After being waylaid first in Sicily and then in Cyprus, Richard and Philip arrived in the Holy Land in June 1191. The joint forces first took Acre and then moved onto Arsuf before fortifying Ascalon. Arguments between who was to become King of Jerusalem escalated and Philip quit the Crusade and returned to France. 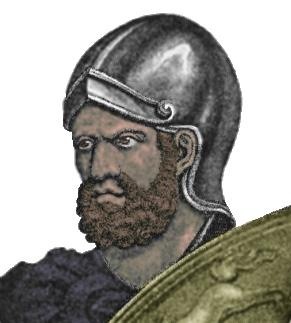 Richard pressed on but when he realized he had no way of securing Jerusalem even if he had managed to capture it, he signed a peace treaty with Saladin and returned to Europe. He spent his final five years reclaiming his throne from his brother John and fighting against Philip’s advances into Normandy. Born in Thrace in 109 BC, Spartacus is most widely known as the gladiator who led the revolt against Rome during the Gladiatorial War. It is not known for sure how Spartacus became a gladiator but the leading theory is that he once fought for the Roman army but deserted and became a thief. He was arrested and sold as a gladiator due to his strength. In 73 BC he and seventy followers escaped from a gladiator school near Capua and fled to Mount Vesuvius where they were joined by local slaves. His army continued to grow until it was 90, 000 men strong and they began wreaking havoc in southern Italy, defeating two Roman armies and plundering any city they came across. From there they marched north into Gaul where he tried to free his men but they refused to leave and they marched again into Italy for more plunder. 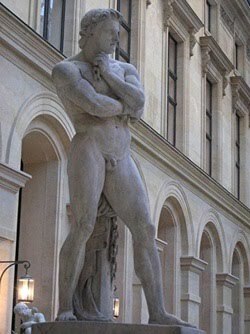 Spartacus was killed in a battle at Lucania in 71 BC and his men were crucified. He has been remembered as a legendary commander not only for his successes in battle but for his own courage strength and compassion. 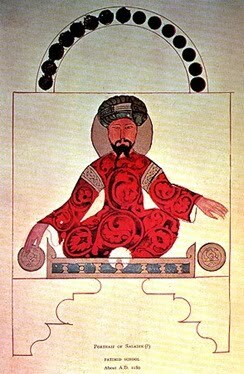 Known to the western world as the antihero of the Third Crusade, he is revered in the Middle East as the hero who returned Jerusalem into Muslim hands. The Kurdish Sultan was born in 1138 in Mesopotamia (now Iraq) and grew up during the First Crusade. He was trained as a soldier by his uncle Asad al-Din Shirkuh and early in his military career he worked on uniting Arab forces under his control first in Egypt then in Syria and Palestine. He then set his sights on Jerusalem and conquered King Guy de Lusignan at the Battle of Hattin. The battle was a tremendous success for Saladin as his army almost wiped out the Crusaders in the Holy Land. The city of Jerusalem fell into his hands when he came to terms with Balian of Ibelin who defended the city after the capture of Guy. His capture of Jerusalem influenced King Richard of England to join forces with King Philip of France and set out for the Third Crusade to the Holy Land. The Christian forces made their way to Ascalon when Richard fell ill and signed a peace treaty with Saladin that left Jerusalem in Muslim hands as long as Christians would be able to safely make their pilgrimage. His reign of Jerusalem was short lived however as he died of a fever on March 4, 1193. Saladin is most often recognized as much for his generosity and chivalry as he is for his impressive military accomplishments. Born the son of a poor Texas sharecropper in 1924, Audie went on to become the most decorated American soldier of World War II. In an attempt to free himself of his hardships, he joined the army as a private in 1942. After his basic training he was shipped to Casablanca, Morocco where he continued with his training. He saw action in North Africa, Sicily, France and Germany and was distinguished by his quick thinking and bravery. He not only destroyed several of the enemy’s machine guns in minutes but also jumped onto a burning tank destroyer and turned its machine gun on the enemy as well as cutting off a German counterattack of six tanks and 250 Infantry practically by himself. 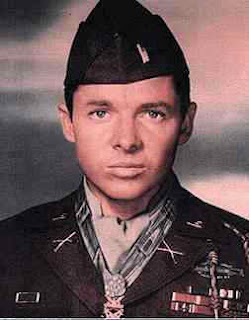 For these acts of courage he has received countless decorations including the Medal of Honor, Distinguished Service Cross, two Silver Stars, the Legion of Merit, two Bronze Stars, and three Purple Hearts; as well as the French Legion of Honor and two Croix de Guerre. He returned to America as a hero and turned his wartime fame into a successful film career. With help from his friends, Audie penned an autobiography entitled To Hell and Back, which was later made into a movie in which he played himself. While on a business trip he died in a plane crash on May 28, 1971 and was buried at Arlington National Cemetery with military honors. 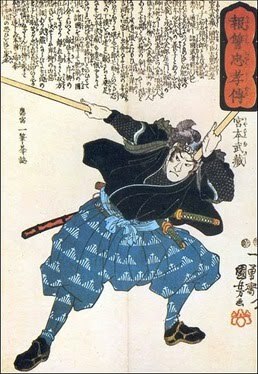 The greatest sword fighter of his time, Miyamoto Musashi, also known as the Sword Saint, is one of the best-known samurai in Japanese history. Born in 1584 in Harima Province, Musashi was raised by his uncle in Shoreian temple. By the time he was 13 he had already won his first duel against Arima Kigei, a student of the Shinto Ryu school of military arts. For the next 16 years he made a name for himself, fighting in more than 60 duels (including against the Yoshioka School and his most famous duel against Sasaki Kojiro) in which he was undefeated. During this time he also enlisted in Toyotomi Hideyoshi’s army and although he was on the losing side, he escaped, crawling among corpses and drinking from muddy puddles to survive. After the war, he turned his attention to teaching swordsmanship and he is credited with creating the nitoryu technique in which you fight with two swords. Later in his life, he became a master painter and writer. His most famous written work is The Book of Five Rings, which covers the sum of his experience as a sword fighter including strategy, tactics and philosophy. At the age of 62, Musashi died of thoracic cancer in Reigando Cave (the same cave where he lived as a hermit while writing The Book of Five Rings). The greatest general in Rome’s history, Caesar came to power first as a quaestor and praetor before being elected as consul and proconsul in 59 BC and organizing the First Triumvirate with Pompey and Crassus. He distinguished himself by leading campaigns in Gaul, Britain and Germany but his growing power scared the senate and he was asked to disband his forces. Not only did he refuse this request, he marched on Rome. He started an outbreak of civil war that lasted until December 49 BC when he held a dictatorship in Rome for eleven days while he was elected as consul. He then chased Pompey to Egypt where he remained living with Cleopatra for several years. On his return to Rome he improved the living conditions of his people and drew up elaborate plans for consolidation of the empire. In 44 BC he became dictator for life, a title that was short lived because on the Ides of March (March 15th) 44 BC, he was stabbed to death by a group of his friends and protégés including Cimber, Casca, Cassius and Brutus. A Carthaginian General, Hannibal was a master strategist who developed outflanking tactics. Dubbed the father of strategy by military historian Theodore Ayrault Dodge, he grew up with a fierce hatred of the Romans. 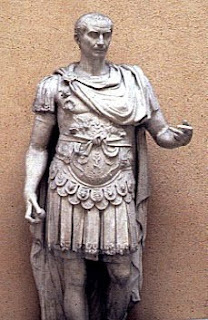 After the death of his brother-in-law Hasdrubal, he took command of the Gaulo-Cathaginian army and set his sights on Rome. He set out in the spring of 218 BC and fought his way through the Pyrenees and the Alps with a force of 46,000 soldiers and 37 war elephants. When he was in Roman territory, he ravaged hundreds of towns leaving complete destruction in his wake. Some of his greatest victories were at Trebia, Lake Trasimenus and Cannae, even turning some Roman cities against his enemies. Scipio eventually defeated him in his homeland at the Battle of Zama, after which he signed a peace treaty in 201 BC. After several years as a suffete, he was accused by his political enemies of conspiring with King Antiochus of Syria. At the threat of a Roman investigation, Hannibal fled to the court of King Prusias of Bithynia where he poisoned himself before the Romans could force him to surrender. A Chinese General, Sun Tzu was the author of the first and most sophisticated book on military theory ever written, The Art of War. 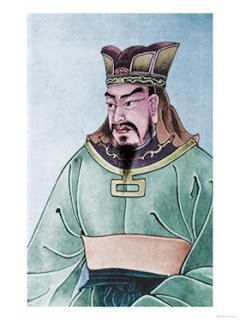 While not much is known about the man, it is generally accepted that he was an accomplished General who served the King of Wu in the period of the Warring States in the 4th century BC. It was at this time that he wrote The Art of War, which covers logistics, espionage, strategy and tactics with a deep reliance on philosophy. The main points it stresses are the high cost of war, the unpredictability of battle, the correlation between political and military policies and the ineffectiveness of setting hard and fast rules. Not only has it influenced Asian military thinking for centuries, but it has also formed the base of the military strategies of Napoleon, Mao Zedong, General Norman Schwarzkopf Jr. and Henry Kissinger. In more recent times, The Art of War has been adopted by business students in Tokyo, New York and London as a text on business strategy. Best known for his heroic last stand at the Battle of Thermopylae, Leonidas’ early years have barely been documented although legend has it that he was the descendant of Heracles. 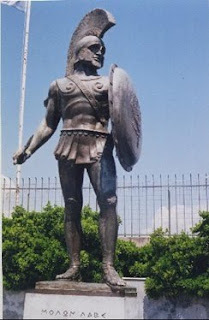 His reign began somewhere around 490 BC and he shared control with Leotychides, as was Spartan custom of the time. The Persian army, led by King Darius, had been conquering Greece for close to ten years when Leonidas became King. When Darius died in 481 BC his son Xerxes continued his father’s expansion into the Greek mainland. In an attempt to stop the advancing army in their tracks, Leonidas (despite warnings by the Oracle of Delphi that told of his death) went to meet Xerxes with 7000 troops including the famed 300 Spartans, at the Pass of Thermopylae (aptly nicknamed the Hot Gates). Xerxes sent in wave after wave of troops including his Immortals who were in turn slaughtered by the Greeks. After a few days of fighting a Greek traitor told Xerxes of a mountain trail which he could use to outflank his enemy. Leonidas learned of the betrayal and sent away most of his men keeping only the 300 Spartans that made up his personal guard. Leonidas’ 300 valiantly fought off the advancing Persians down to their last man. Leonidas was killed and his body was beheaded and crucified which only served to anger his fellow Spartans who expelled the Persians from Greece a few months later at the Battle of Plataea. 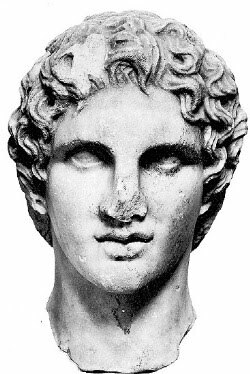 Arguably one of the greatest generals of antiquity, Alexander’s conquests extended the Macedonian kingdom from Greece to India, almost the entire known world at the time. Born in 356 BC his early years were spent under the tutelage of the philosopher Aristotle. His early military career was spent releasing Greece from the grasp of the Persians. From there he moved through Syria, Egypt (where he founded the city of Alexandria and visited the oracle of Ammon and claimed his divinity), and Asia Minor before his final conquest into India. He then returned to the west and began making preparations to invade Arabia but before he could achieve this conquest, he fell ill and died in June 323 BC. Throughout his reign, the casualties of his troops compared to those of his enemies were considerably less, mostly due to his quick tactical thinking and his love for the men who fought under him. Where is Chinggis Khaan???? i'm from Mongolia.